DiscountPaint.net :: DECORATIVE PAINTS :: METAL EFFECTS-MODERN MASTERS :: MODERN MASTERS 99992 ME-208 REACTIVE METALLIC PAINT IRON SIZE:16 OZ. Metal Effects™ water based Iron Metallic Paint contains real iron particles. This paint will tarnish naturally over time and when exposed to the elements. Metal Effects™ Rust Activator, when used in combination with the Metal Effects™ Iron Metallic paint, creates a real weathered rust finish. 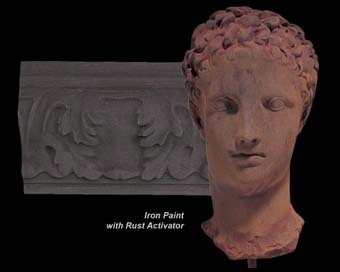 The Metal Effects™ Rust Activator is to be used over Metal Effects™ Iron Metallic Paint only; do not use it over any of the other Metal Effects™ paints. Metal Effects™ Iron Metallic Paint is a water-based modified acrylic paint formulated with real iron particles. It will rust naturally over time and when exposed to the elements. Metal Effects™ Rust Activator will speed up the oxidation process to create a beautiful, authentic rust patina on any paintable surface. Metal Effects™ Iron Metallic Paint can be brush, roll, or spray applied with an HVLP sprayer. The Metal Effects™ Rust Activator can be applied with a brush, sponge, spray bottle, or spritzer. The system is ideal for use on properly prepared metal, wood, plaster, canvas, paper, or plastic surfaces. Popular applications include moldings, trim, columns, doors, furniture, rain gutters, railings, lamps, vases, and planters. Modern Masters Metal Effects™ Iron Metallic Paint, when used with the Metal Effects™ Rust Activator Solution, will create a ‘real’ aged and rusted metal surface on any paintable surface. Use them together on metal, wood, plaster, canvas, paper, or plastic. Step 1: Properly prime the surface with Metal Effects™ Acid Blocking Primer and allow to fully dry. Metal Effects™ Acid Blocking Acrylic Primer is especially formulated for use with the Metal Effects™ Metallic Paints. Do not use any other primer, especially when working on non-iron metal surfaces. Two coats of primer are needed, especially over metal or alkaline surfaces. Allow to dry at least 12 hours. Step 2: After the primer (if used) has fully cured, apply at least two coats of Iron Metallic paint. Use a brush, roller, or an HVLP spray gun. For brushing, use a high quality brush made for water-based paints. Allow the Iron Metallic paint to dry between coats and to completely dry before continuing on to Step 3. Step 3: Apply the Rust Activator with a brush, sponge, spray bottle, or attach the spritzer cap directly to the 4 or 16 ounce Patina bottles and mist on. If an evenly rusted appearance is desired, stipple the wet surface with a brush or block stippler. After 5 minutes, reapply the Rust Activator. As the activated surface dries (approximately 30 to 40 minutes) a true rusted finish will appear. Cold temperatures and/or high humidities will prolong the patina oxidation process and the dry time. Tip: For best appearances, leave the rusted patina finish open. Note: If maximum protection from the harmful effects of UV and weathering is required, apply Modern Masters MasterClear Polyurethane/Acrylic Interior/Exterior Topcoat protective overcoat on top of the Permacoat. Note: Do not apply MasterClear directly onto the rusted finish. This can alter the color of the rust patina. Coverage: ME208: 1 gallon/3.78 liters will cover approximately 300 sq. feet/28.8 sq. meters. ME208: Drying time at 70°F and 50%RH: Re-coat time is in approximately ½ hour. Dry time is in approximately one hour. Full cure is in approximately 24 hours. Lower temperature and higher humidity will lengthen the dry and cure times. PARABOND 081379 MULTI-PURPOSE FLOORCOVERING ADHESIVE (INDOOR) SIZE:1 GALLON. GUARDSMAN 3150 FURNITURE DUSTING CLOTH PACK:12 PCS.